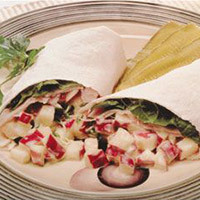 This turkey wrap is perfect for lunch on the go and will delight with every bite. Combine apples and yogurt; set aside. Divide and arrange spinach, turkey, cheese, and sprouts evenly over tortillas. Place ¼ of apple mixture down center of each tortilla. Fold two opposite sides in about 1 ½ inches and roll. Cut each wrap in half and serve immediately.